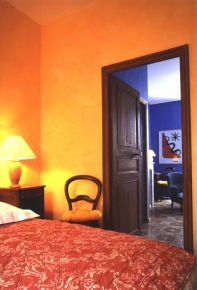 The four guest rooms are always hed up in books and magazines in recognition of the comfort, the high standard of the renovation and the quality of the activities offered. You can stay for one night or many nights throughout the year. The beds are made and the towels are provided. The ample breakfast is included in the price for the room. For lunch and dinner ‘Le Clos de Cascastel’, the restaurant in the village, is 200 metres from the Domaine. Here you can enjoy a meal where importance is given to the use of fresh products. You can discover a dozen more restaurants within a radius of 15 km, most well know of which is the “Auberge du Vieux Puits” awarded three Michelin stars, and where the chef Gilles Goujon, an ambassador of Mediterranean culinary art, has justifiably earned his reputation. 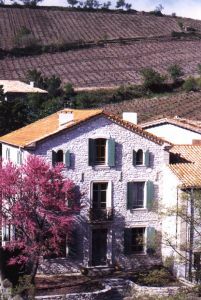 The house of local stone built for a Master Vigneron in the 19th century has been renovated but the majority of the original details have been preserved: the ironwork balconies, which were part of the Château of Cascastel, the tiled floors and mosaics, friezes, arched windows and stained glass. The building is situated above the small wine producing village of Cascastel which has 200 inhabitants. As a guest you will not only be able to enjoy the atmosphere of a large wine grower’s property in this region of the Corbières but also you can relax and absorb the ambience of the region reflected in the decor and the furnishings. The entrance hall is decorated in colours to give a warm welcome. 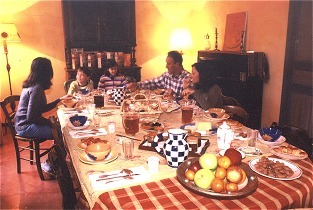 To the left is the large breakfast room where a Schimmel piano is available for any pianist. To the right is the almond green kitchen with olive (‘Lustucru’) green tiles where the copious breakfasts are prepared. There is now a wine tasting room in what was formerly the smoking or withdrawing room which has deep comfortable settees covered in a fabric with a design of deep, rich, wine red squares where you can read, dream, taste wine, talk or enjoy the silence.. The hall has walls decorated with garlands of roses against a background of sunshine yellow and in this setting are placed original paintings and ornaments. 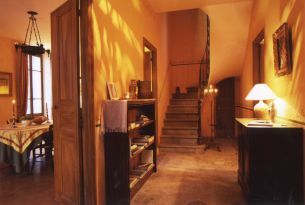 The stairs take you up to the large guest rooms all dedicated to a variety of vine grown in the Languedoc. 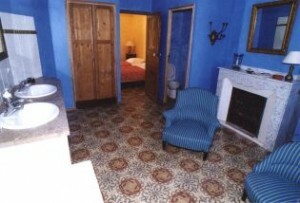 Each of the rooms has its own bathroom, some have a fireplace and all have the perfume of the garden. 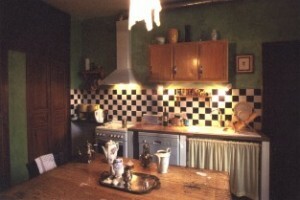 On the first floor to the right is the Carignan Room, decorated in gold and green. It is equipped with a bed 180 x 200, but this can easily be converted to two single beds 90 x 200. The large bathroom has a small corner with two armchairs which allows a moment of repose looking out to one of the palms in the garden; the toilet is separate. 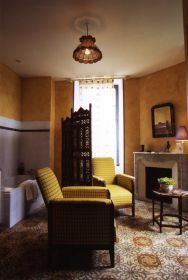 The caramel coloured washbasins blend with the Indian screen which in turn harmonise with the Art deco armchair, and the floor tiles are a souvenir of the 1920’s. 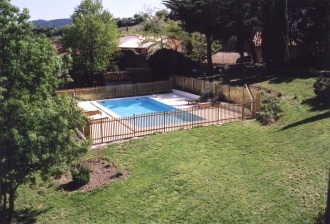 The room has a view over the garden and swimming pool. On the first floor to the left is the Grenache Room painted in shades of rose and fuschia, lightened by the mimosa coloured curtains printed with turquoise, cobalt and emerald medallions which have been designed by Tricia Guild. There are two single beds 90 x 200 but these can easily be joined to make a double bed 180 x 200. The blue of the bathroom is like the sea around the Cyclades and invites you to immerse yourself in the deep blue water and contemplate the lamp shade which is in the shape of a witch’s hat! There is a view of the garden and the village. On the landing the small oriental room is a place to read, play games or to enjoy the company of others. The atmosphere on the second floor changes: rush matting made from sea grass contrasts with the Catalonian earthenware tiles in the bathroom. On the right is the Syrah room from which the 1000 meter high ‘Mont Tauch’can be seen. The room is a balanced mix of colour and texture – the walls are vanilla and the floor covered in rush matting and earthenware tiles. The porthole shaped window gives an impression of being at sea and through it can be seen the swimming pool glistening in the sun and the shady pines of the garden from the two other windows. The settee could easily be turned into a comfortable bed for one or two additional people. 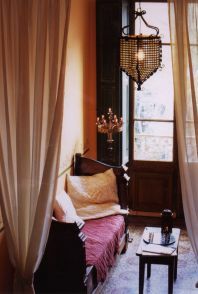 The honey coloured muscat wine sets the tone for this room lit by lamps whose bases are decorated with flowers and vines The curtains are bordered with mauve, deep purple and yellow ochre – colours echoed in the bathroom. This is the largest and most spacious of the four rooms and is arranged as two spaces separated by a screen. It makes an excellent family room and four people can easily be accommodated on the two large double beds which can also become single beds; a settee could easily be turned into a comfortable bed for one or two additional people. The window looks out on the Cascastel château and beyond that the Garrigue – uncultivated ground where plants typical of the region grow, namely holly oak, gorse, lavender, rosemary, thyme and throughout the year a profusion of flowers. In the bathroom there is a large angled bath which invites long, lazy soaks. 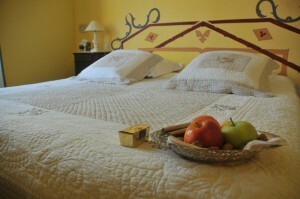 Price per night with breakfast : for 1 person 100 Euros, for 2 people 115 Euros, for 3 people 145 Euros, for 4 people 175 Euros, for 5 people 205 Euros and for 6 people 235 Euros. 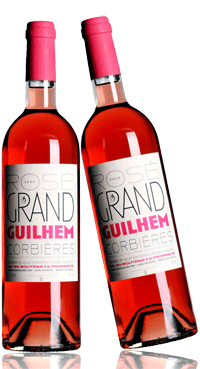 Carignan, Grenach and Syrah are the three grape varieties in Fitou wine of the High Corbières. If you have difficulty in deciding exactly which room to have perhaps you might recognise yourself in the descriptions given by lovers of wine: Carignan has power and range and the colour is rich and deep. Grenache is supple, mellow, delicate, smooth and velvety. Syrah has an ethereal quality, is elegant, and lingers in the mouth. Le Muscat – it is necessary to speak of Muscats since ‘Muscat d’Alexandrie’ and ‘Muscat petits Grains’ figure equally in the development of this famous wine created in 1295 under the direction of Arnau de Vilanova, doctor at the court of the King of Majorca – and is perhaps the most difficult to pin down. The house is surrounded by a secluded, tree shaded garden of Provençal Cypresses, Alep Pines and Palms. Some of these trees are 100 years old. 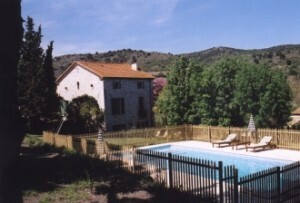 There is a view over the Roman tiled roofs of the village, the vines and the Corbières hills. Outside there is a stone table ‘monastère’ where you can have breakfast. 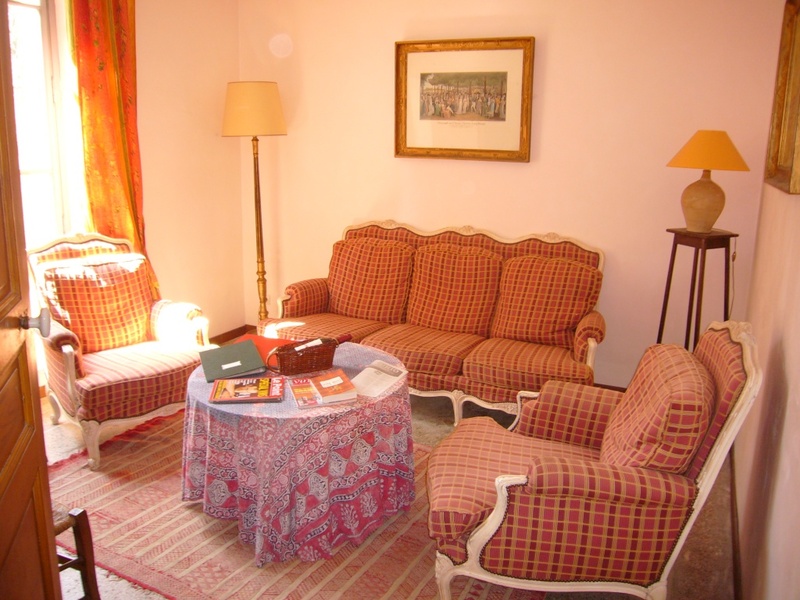 The rooms are furnished with period furniture of the 19th century (Louis-Philippe and Napoléon III): chest of drawers, wardrobes, winged armchairs, armchairs, lights, and also modern pieces. The renovation and the decoration is of a high standard and in the spirit of the Mediterranean region. 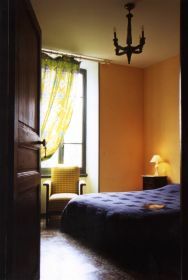 The walls are painted with lime based paints in warm colours and the fabrics and net curtains are designed by Patricia Guild. The hexagonal terracotta tiles and earthenware pottery are hand made. The beds are good quality with slatted bases, Bultex mattresses and cotton sheets. The bath towels, hand towels and face cloths (gloves) are provided. 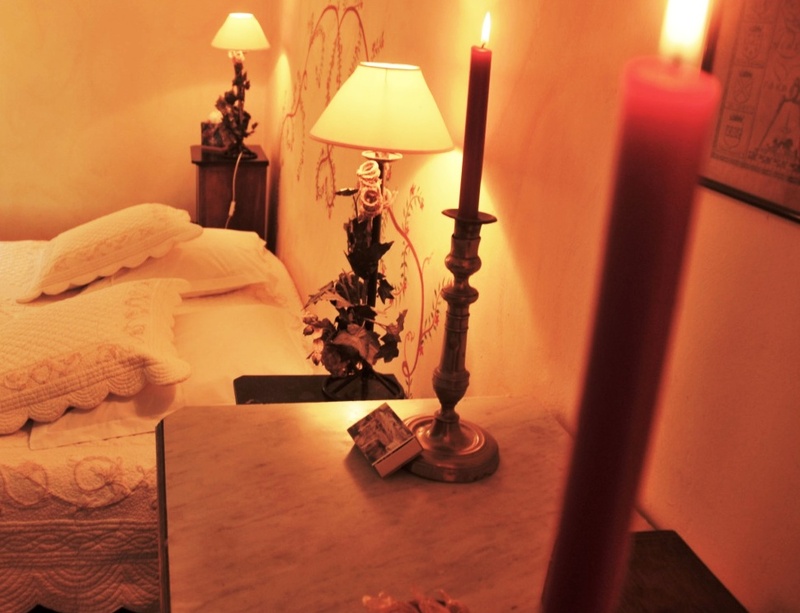 There are times where we wish to spend or to offer an exceptionnal night. Our “Guilhemissimo” offer : particullary georgious decoration, bathrobes, fresh fruits, flowers, chocolates and other regional sweets, bottle of a great wine from the Domain, possibility of breakfast in the room with Limoges porcelain and silver plates, … to live a great time. 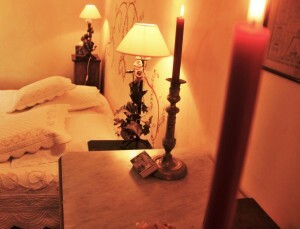 Additionnal price for 2 people : 59 Euros. It is also possible to rent all the Family Mansion, with private pool, for a maximum of 14 people. 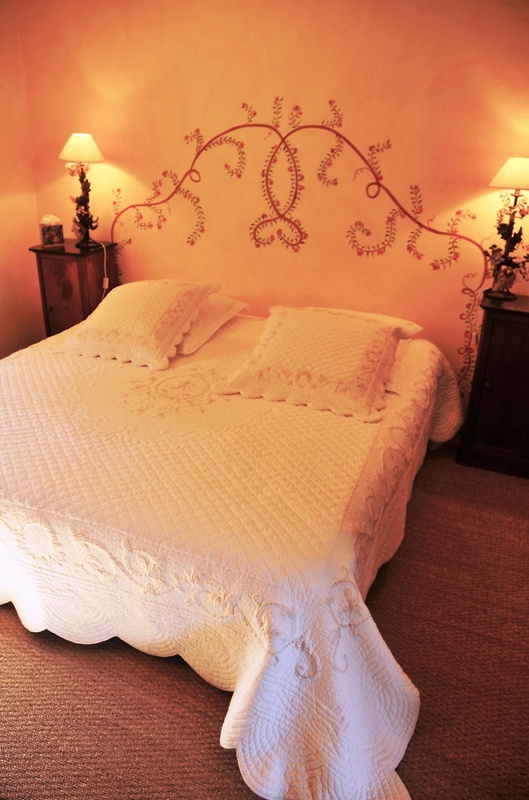 The beds will be prepared at your arrival (according your request : possibility of double beds or single beds in each bedroom), towels and linen are provided, final house-keeping is included and also all charges. 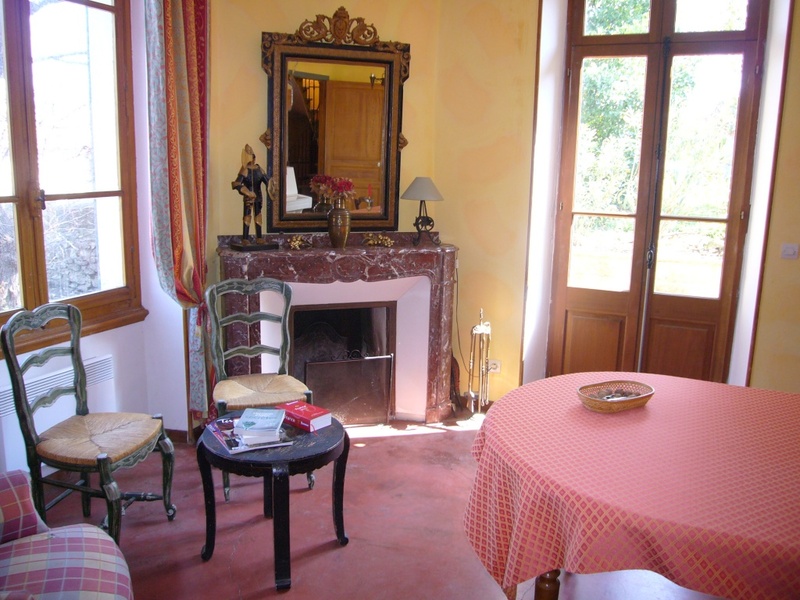 The renting weekly price is 1870 € in out-season periods, 2320 € during small French Holidays, 2740 € from June,28 to July,19 and from August,23 to August,30 and 2960 € from July,19 to August,23. 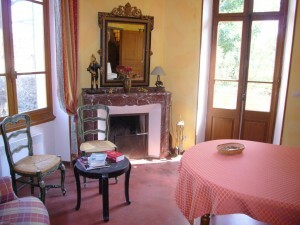 Is is also possible to rent the house from 2 nights (700 €) or more in out-season periods.